Sweetfern is a native shrub to eastern Canada and eastern U.S. It is in the bayberry family (Myricaceae) and tends to occur in colonies. This is not a true fern despite its name. 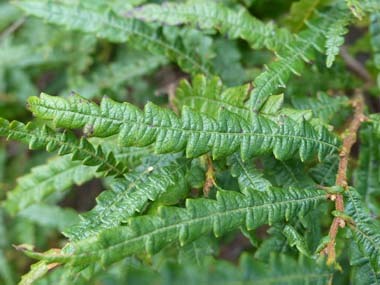 Sweetfern has medicinal properties and has been known to assist every organ in the elimination of toxins. It helps to clear lymph, blood and skin. A cold water infusion has been used externally by some people claiming that this helps to counter the effects of poison ivy. Distinguishing Features: Sweetfern is technically categorized as a shrub that has fern-like leaves which are quite aromatic when rubbed. In many cases it has the appearance of being a plant with multiple stems; as it gets larger its branches spread out. Flowers: Separate male and female flowers are borne in catkins or dense, cylindrical clusters that develop in April and May. Male catkins are elongated and female shortened ovals. 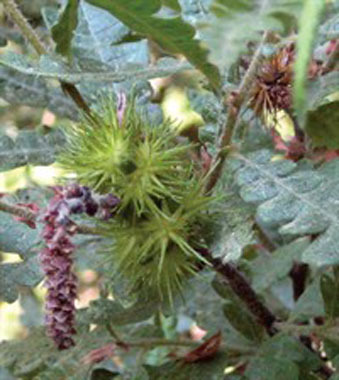 Olive brown, burr-like fruits develop from pollinated female catkins by early summer (edible nutlets are inside the burr). 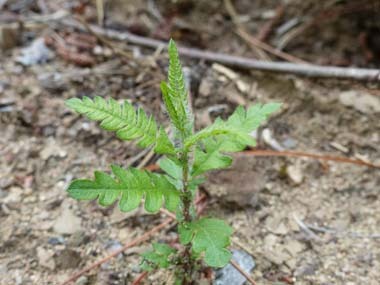 Fields of Nutrition has medicinal benefits and vitamin/mineral content of Sweetfern. Leaves: Alternate leaves occur along the twigs and shoots. These leaves are 5-15cm long and up to 2cm across; they are narrowly oblong to oblong-elliptic in shape and they have 3-8 pairs of oblique lobes. 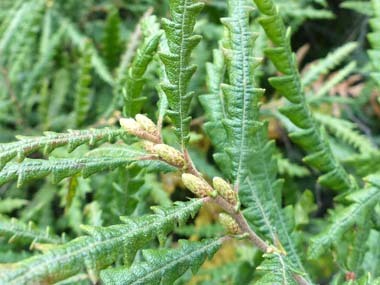 The upper surface of mature leaves is medium green and mostly glabrous, while the lower surface is light green and nearly glabrous to short-pubescent. Height: This shrub grows to about 1 metre in height. Habitat: Sweetfern grows primarily in Ontario, Quebec, the Maritime provinces as well as the eastern and parts of central United States. They flourish in well-drained soils, full sun to light shade, open woods, roadsides and sandy barrens. 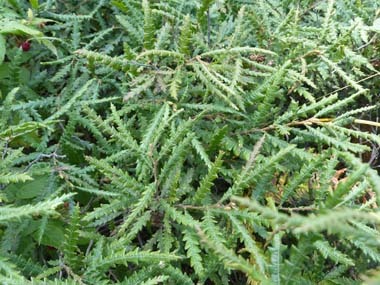 Sweetfern is drought-tolerant. Edible parts: The nutlets are edible. Tea can be made from the leaves. Dried and powdered leaves can be used as a spice.